London, 17th April – Climate justice campaigners held a colourful and musical protest outside Drax Plc’s Annual General Meeting in London earlier today, denouncing the company’s power station as the UK’s single biggest emitter of CO2, and exposing the disastrous impacts of its biomass, coal and gas burning on climate, forests and communities. Protesters gathered with percussion instruments, banners, placards, pictures of animals whose habitat is at risk from the biomass industry, and a large cardboard smokestack. 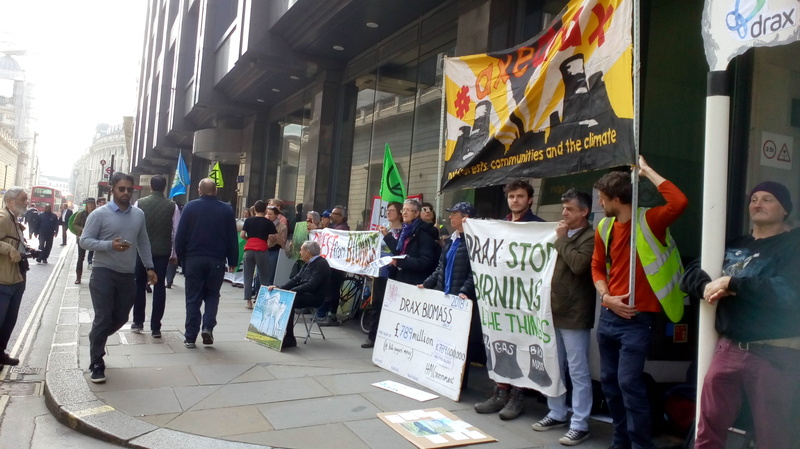 Some of the protesters have gone on to the government department responsible for the £2.2 million in subsidies received by Drax every single day, demanding that those be redirected towards low-carbon renewable energy such as wind, wave and solar power. Meantime, a group of local residents in Yorkshire gathered outside Drax Power Station with banners reading “Drax the Destroyer” and “Drax – Stop Burning All the Things”. In Sheffield, student group Clean Energy Switch, held a solidarity banner protest. Available from https://drive.google.com/drive/u/0/folders/1vuOsXH7yX2nVxpEEGKrUFgarRSR2yGki . Email biofuelwatch@gmail.com for additional photos. 1. See biofuelwatch.org.uk/wp-content/uploads/AxeDrax-briefing-2019.pdf for a referenced background briefing about Drax. 3. See dogwoodalliance.org/2019/03/gearing-up-for-a-big-fight-in-mississippi/ for details about the campaign against Enviva’s proposed pellet plant in Mississippi.